In 1990, the Floresta Amazônica Hotel (FAH) purchased an area of 700 hectares on the right bank of the River Cristalino and, a few years later, established the first private conservation area in the Mato Grosso state section of the Amazon. The Cristalino Private Natural Heritage Reserve (RPPN) covers 670 hectares and the remaining 30 hectares were set aside for the Cristalino Lodge ecotourism venture, which supports the conservation of the area. Subsequently, three more reserves were defined on the left bank of the River Cristalino, two of which (Gavião-real, covering 2,420 ha, and Mirante da Serra, covering 1,616.7 ha) are already RPPNs, while the third (Castanheira, covering 2,502.7 ha) is awaiting finalisation of the process of creating an RPPN. Together, the four reserves amount to more than 7,000 hectares, in a region that is an extremely high priority for conservation, and they are used for research, environmental education and controlled visits. In the vicinity of the reserves, there is other land that is protected by the owners: Ariosto Island, with 536 hectares of native forest in the River Teles Pires, and the Cristalino Farm, covering 3,701 hectares. HIGH NUMBER OF ENDEMIC SPECIES IN THE REGION. 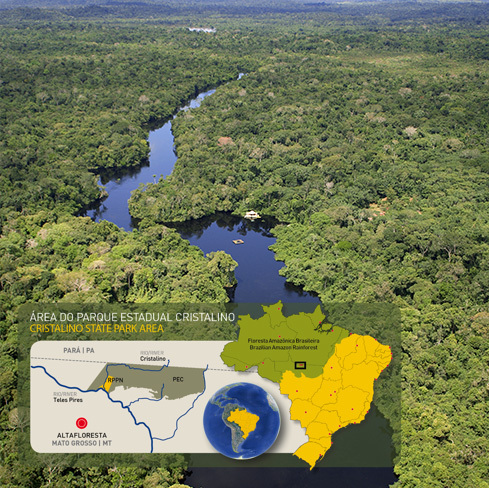 The geographical location of the Cristalino RPPNs is of strategic importance to the conservation of the Southern Amazon, because along with other conservation areas (Cristalino State Park, Juruena National Park, Serra do Cachimbo Springs Biological Reserve), surrounding Amerindian Lands and the local Brazilian Air Force Base, they form an ecological corridor and important natural barrier to contain the “Arc of Deforestation”, where the agricultural and real-estate frontier is advancing towards the forest. In order to develop a sustainable economic model, based on ecotourism and generating jobs and income for the community of Alta Floresta and the surrounding area, the Cristalino Lodge ecological hotel was established. In partnership with the FEC, it has developed a cooperative model whereby ecotourism generates resources for the maintenance of the RPPNs and for the development of scientific research and environmental education projects. As RPPNs estão localizadas em terreno geológico antiquíssimo (cerca de 1.800 bilhões de anos), formado por rochas graníticas e vulcânicas. Nesta região pode-se observar a transição da Floresta Amazônica em relevo que varia entre 250 a 450 metros de altitude, compondo diferentes ambientes, tais como: floresta ripária, floresta de terra firme, floresta de igapó, floresta semi-decídua, floresta decídua, campinarana, tabocal e campos rupestres. Already, 1,400 species of the Cristalino region’s rich flora have been catalogued, leading to the discovery of four species that are new to science. 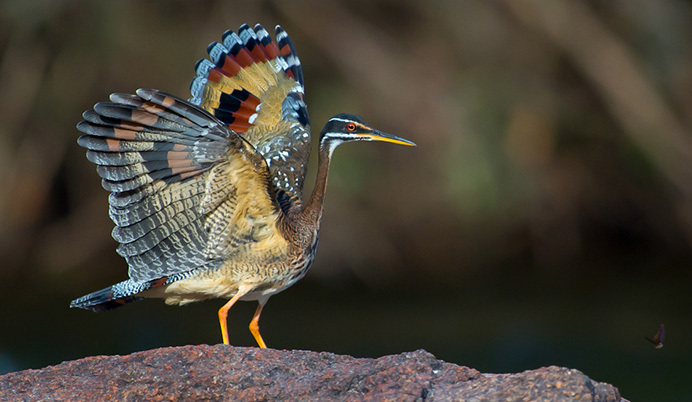 A total of 595 bird species (approximately one third of the Brazilian total catalogued to date), 1,500 species of butterflies, 50 species of non-flying mammals, among them seven primates, have also been catalogued. 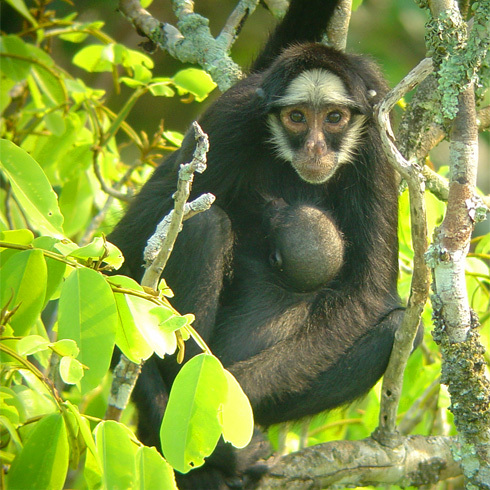 Among the endangered species of fauna found in the reserves are the harpy eagle (Harpia harpyja), giant anteater (Myrmecophaga tridactyla), jaguar (Panthera onca) and white-whiskered spider monkey (Ateles marginatus).